Note: This post contains affiliate links and I will be compensated if you make a purchase after clicking on my links. I was compensated for this post. Alaska is the place where I fell in love with photography! I’ll never forget that first trip in 1996 and the late night stop at Wal-Mart (not a good idea by the way) to purchase my first more serious point-and-shoot camera with my own money! The next day I took off for a trip that would change my life forever. I spent 12 days with 2 college buddies exploring one of the most beautiful places on the planet and taking some of my first photos along the way. I owe Alaska and the beauty and wildness of the flora and fauna there for my passion for capturing images! Now I am a serious amateur (see my pics here) making a few dollars here and there from my photos. Maybe more importantly, I save a lot of money on not having to purchase pictures for my blog. Now I can use my own! I am on my third camera body and have purchased eight or nine good lenses. I always try to find the best gear possible for the least amount of money. No matter what level of photography you shoot, finding the right gear at the right price is essential! There is always a fine balance between having the best possible gear and finding it at the lowest price. Especially if you are a casual photographer who likes to capture images on your travels. One key to accomplishing gorgeous pictures on a budget is to shop used equipment. To be honest, my wife and I have always shopped used – used clothing, used furniture, used cars, etc… Of course, we wouldn’t shop used underwear and I prefer not used shoes (that’s a personal preference 😉 ) but anything else offers higher quality at a great price if used. I believe so much in shopping used that 10 years ago I opened a furniture and home decor consignment store (see it here). I make my primary living now selling used household goods. We have expanded to 3 stores in 3 cities across 2 states and we are so proud of what we do! I love shopping used because you can get so much more for your money, especially if you make sure that you are using a reputable and safe source for your used purchases. bodies that I can afford that I would have never been able to buy new. Some of my most prized shots that have earned me money were taken on equipment that was purchased used. Heck, as far as that goes, as soon as you shoot your first image on a brand new out-of-the-box camera, it is a used piece of equipment. In light of that, that first shot is the most expensive image you will ever capture on that camera! The purpose of this site is to work hard to help turn your Alaska vacation into an epic adventure. For that reason, I want to introduce you to KEH Camera. KEH claims to be the largest retailer in the world for pre-owned cameras. They have a very user-friendly website and a active eBay store. I have personally purchased products from KEH and been very satisfied that what they promised was what was delivered. What Makes KEH Camera Great? KEH has been in the camera repair and resale business for over 38 years, so you can buy knowing that you are getting that kind of experience behind the refurbished products. Here are a few reasons that I feel very confident to refer you to KEH Camera. I would recommend paying up a bit to stay in the Excellent or higher grades, but I have purchased a lower grade lens that I wanted to experiment with in the Bargain grade just for the value and opportunity to try something new. You can shop with confidence knowing that KEH Camera fully guarantees the functionality of their equipment. Any camera from grades (LN) to (BGN) are covered under the 180-day warranty. If you do a little research online, you will find a few issues with their return policies, but it seems that in almost every case the complaints have been reconciled and closed. The main point is that KEH offers a top quality product delivered as they promise and in the condition inspected by their technicians consistently. Extended Warranty is also available through a third-party at KEH. KEH has a very high satisfaction rating on Google Reviews. They rank a 4.8 star 97% positive rating out of over 8,000 customers at Google Shopping Review. 85% of their reviews are 5-star ratings. As of this writing, KEH carries over 50,000 camera bodies, lenses and accessories. This makes KEH one of the best options for finding what you are looking for in quality gently-used and refurbished camera equipment. 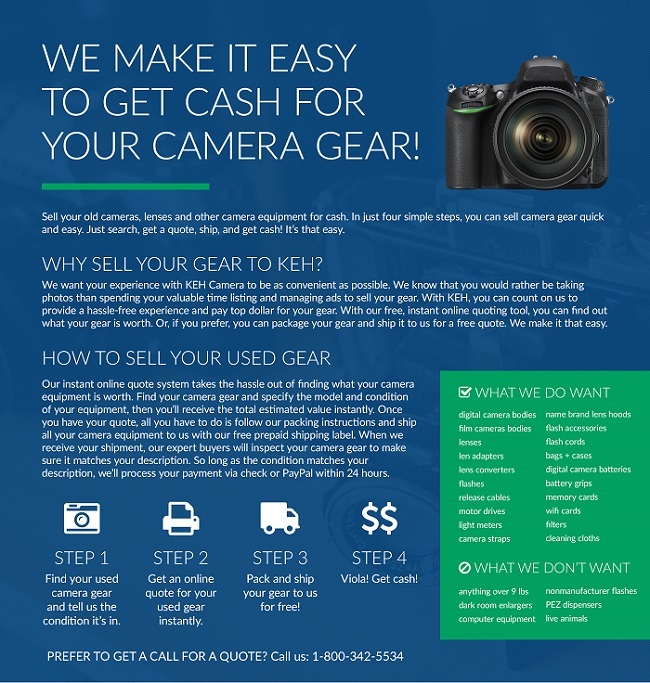 My favorite feature of KEH is the option to sell your old equipment for cash! 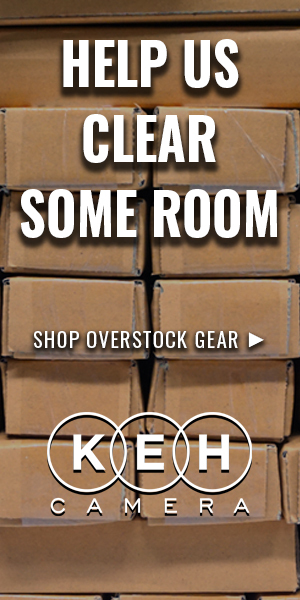 If you have excess pieces of gear that you no longer need, the cash you are offered from KEH can go toward new gear increasing the value of shopping with KEH. Why pay retail when you can get so much more for less? KEH is a wonderful solution to your needs for higher end equipment for a lower price. As you prepare for your upcoming Alaska vacation, I would highly recommend a good camera. Whether you want to go with a high-end point and shoot or take this opportunity to dive into feature-loaded semi-pro or pro cameras, KEH will help you get started on a budget. as a great source of good used camera equipment! Click Here to Shop at KEH! ← What should I do in Alaska? Recommendations for a Friend.